Scooters - The revolution of electric scooter and bike apps is much more powerful than ridesharing. That’s because ridesharing is more expensive than scooters because you must pay the driver. Plus, the depreciation and maintenance of cars is much more than it is for scooters. Many people have over-exaggerated how quickly self-driving cars will arrive. If people use Uber without the driver, it will be cheaper than buying a car. Uber and Lyft will be accessible at all times, in more places when self-driving technology exists. For now, ride sharing apps are a cheaper alternative to taxis and are easier to ping. However, buying a cheap car and using public transportation are cheaper. Micro-mobility options lower traffic and aren’t reliant on fossil fuels. For now, gas prices are very low. But if they increase because of limited supply, it will be a big issue. Traffic will always be an issue because of increased urbanization. Both ride sharing and micro-mobility apps help city dwellers avoid paying for parking. 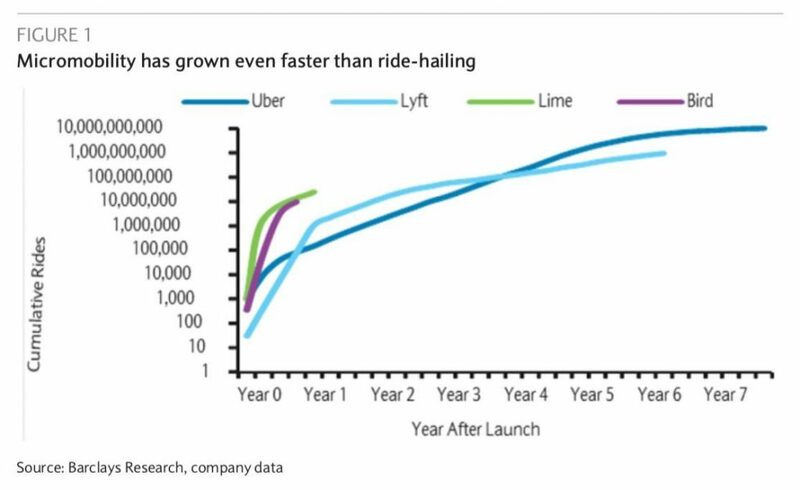 As you can see from the chart below, the electric scooter and bike sharing apps, Lime and Bird have had more cumulative rides since their launches than Lyft and Uber had after they were started. These micro-mobility apps aren’t even available in New York City, so they have plenty of runway to keep growing their cumulative ride total. Issues with scooters such as safety and storage, city governments delay allowing them. It’s bad for the city if people leave their scooters in the middle of the sidewalks. Scooters - It’s noteworthy that micro-mobility’s advancement will lower the need to buy a car. The impact will accelerate. A scooter can replace a car because, as the chart below shows, 60% of journeys people make are less than 5 miles. These electric mobility options cost $1.40 per mile, while medium distance trips using cars and taxis cost somewhere less than $5 per mile. If you use an electric bike most of the time and have the option to use ridesharing for your rare medium distance trips, buying a car might not be necessary. With the decline in the rate of teenagers getting car licenses, it’s possible young people see car ownership as a thing of the past. It’s also possible the decline in young people working is part of the reason less are getting licenses. I am trying to figure out if the manufacturing weakness from February continued into March. The Empire Fed index says yes, but the Philly Fed index says no. As you can see from the chart below, the average of the Philly Fed and Empire Fed manufacturing readings increased because the Philly Fed index improved more than the Empire Fed index fell. The March Empire Fed general business conditions index fell from 8.8 to 3.7. This missed the consensus for 10. It was below the low end of the estimate range which was 8. Specifically, the percentage reporting better business conditions fell 2.4 points to 29.1 and those stating conditions got worse increased 2.7 points to 24.4. This reading is far from the weakness in early 2016 where it was just above -20. That’s in tune with industrial production which is seeing declining, but still positive, yearly growth. The manufacturing sector isn’t in a recession yet. The new orders index fell 4.5 points to 3. The shipments index fell 2.7 points to 7.7. The average employee work week index fell 5.9 points to -3.4. In the February labor report, the length of the work week fell which is why weekly earnings growth fell. To be clear, the Empire Fed report only measures the manufacturing sector of one region, so it doesn’t mean the length of the overall work week will shrink again in March. Scooters - Since the length has been stable ever since the early stages of the expansion ended, investors expect it to snap back in March. The prices received index fell 4.8 points, but the priced paid index increased 7 points as manufacturing firms might be hurt by rising oil prices. The 6 month forward looking indicators decreased less than the current index, which is a modestly positive sign. The forward general business conditions index fell 2.7 points to 29.6. The new orders index fell 6.7 points to 29. Shipments fell 7.4 points to 27.7. Just like the current index, prices paid rose and prices received fell. Both the capital expenditures and technology spending indexes fell modestly. Capex fell 1 to 28.3 and tech spending fell 1.8 to 20.3. 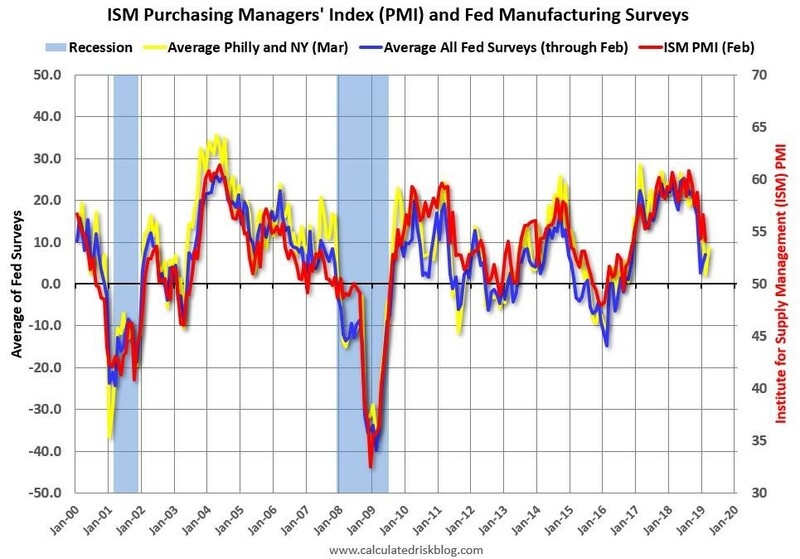 After the Philly Fed reading was worse than most manufacturing surveys in February, it rebounded sharply in March, signaling we aren’t in a manufacturing recession after all. The Philadelphia district was one of the two districts the Fed mentioned as not growing in its January Minutes. The business conditions index increased from -4.1 to 13.7 which beat the consensus for 5.5, but was slightly below the high end of the estimate range which was 15. New orders improved from -2.4 to 1.9. Shipments increased dramatically from -5.3 to 20. Both prices received and prices paid fell. The 6 month forward looking index was the opposite of the current index as its general business activity index fell from 31.3 to 21.8. This is a historically low reading just like last month’s current conditions index. New orders fell from 29.4 to 19.8 and capex fell from 31.7 to 19.5. In the special questions section, 73.6% of firms said they are seeing labor shortages which is up from 63.8% last year. Even though more firms said they are seeing labor shortages, only 66% said they are increasing recruitment efforts which is down from 75.4% last year. In total, the two regional Fed reports didn’t tell us much because they gave off mixed signals; the current Empire Fed index was weak and the current Philly Fed index was strong. I’ll be looking at the other regional Fed reports closely to help me predict where the manufacturing ISM is headed. Manufacturing recession concerns will grow if the PMI falls further.